I'm wondering if you're very patriotic? or one to decorate my house with all things British. I think with having created some British giveaways I can't help but feel a little excited at seeing British related items. Ok so I know I'm seeing a lot more lately because of the Queen's Jubilee and the Olympics as food wrappers are changing, there are little sections around stores selling clothes, jewellery or household items with a Union Jack on but it actually leaves me quite excited to see them. I'm curious also to know if your country will do anything for the Queens Jubilee? but I know in countries that don't belong to Britain they were alot more involved then us. and are planning huge events. I guess the Olympics came at the right time too as its added an extra buzz in the air even though there usually was for the football, Olympics and cricket. 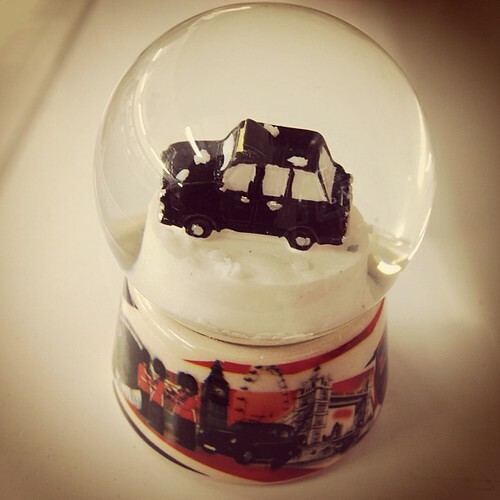 By the way that little snow globe is sadly still in the shop as it would have been too lethal for me to buy as there was also a bus, a phone box, a post box and some other things and I liked them all but as I haven't done anything on a black taxi cab yet I thought I should photograph it there. We've never had black cabs in Bradford but I know in some places they are a big thing. What are some of the traditional things about your country? So if your willing to share please do! Becca I'm glad its not just me, oh course I know what people are into but due to writing letters and blogs as a lot of people are obsessed with London and I have no idea why as they live in much more beautiful places. Thanks so much for sharing as I didn't know about the eagle at all :). I think with me it mostly comes down to my experiences at school, we never really went indepth in the history of things so we didn't have that passion to find out more or enjoy it. So it just by passes me but its still nice to see all this 'souvenir' style things in the shop.